Mischa Kuball will be contributing two site-specific installations for détournement 2009, a collateral event exhibition of the 53rd Venice Biennial. These two installations address the exhibition’s theme "word, image, and memory". As part of the show’s concept, the installations are located in usually hidden, historical spaces on the Venetian islands. Located along a path between Piazza San Marco and the Arsenale, Public Preposition no. 1 is a two-part light artwork installed at the Caserma Cornoldi. This is a military facility and also an archaeological site to unearth the remains of a church and monastery from the 14th/15th century. 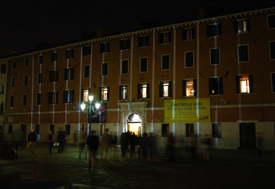 This site was converted to a military base in the early 19th century by the French during their occupation of Venice; since the later-19th century, the Italian government has used the site as a headquarters for the administration of international peace missions. These missions are individually referred to by the military as an intervento ("intervention" in Italian). 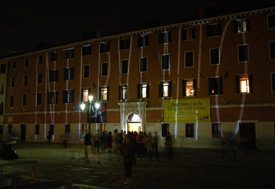 In this two-part installation, Mischa Kuball will present a light projection of the word "INTERVENTO" against the façade of the front of the Caserma Cornoldi (Riva degli Schiavoni/Castello) in the evening darkness. This work refers to signage of theatres of an earlier generation and the intervention aims to provide a playful cinematographic presence amidst the cool shadows, aura and atmosphere of Venice. The building’s interior courtyard, which will be open to the public especially for détournement 2009, will also include another light projection of "INTERVENTO", here, against the partially excavated patio. In both works, the projections alternate from abstract lines that morph to letters spelling out "INTERVENTO". Mischa Kuball. Tood-Taboo-Trance (2007/2009). Palazzo Albrizzi, © Photo: Archiv Kuball. This installation is situated at Palazzo Albrizzi (Cannaregio). For this site, Kuball is installing Tood-Taboo-Trance (“Death Taboo Trance”), which consists of projections of these three words onto three hanging mirror balls in the middle of the room. The colours red, green, and blue (RGB, which when combined produces a broad range of colours) are also projected onto the mirror balls. 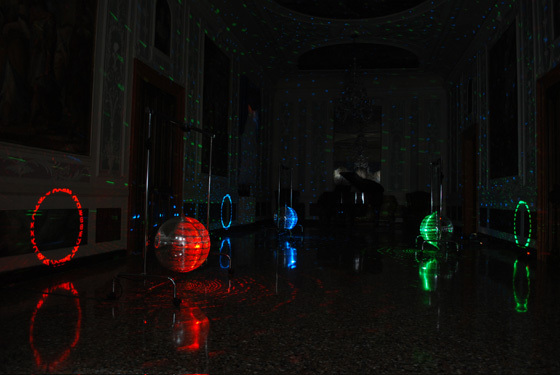 These projections then reflect on the mirror balls’ surfaces and onto the historical interior of the Sala della pace with its frescoes. The result is an aura of constantly changing colour and letters of the words against the surfaces of the interior space. This installation aims to highlight in-between situations and oppositions including: life and death, what should be touched and not touched (taboo), being in control and losing control (trance), as well as time, space, and colour. This work also refers to five of Kuball’s previous interior mirror-ball installations; the first was exhibited at the Konrad Fischer Galerie (Düsseldorf) in 1996. Tood-Taboo-Trance (2007/2009) is presented on loan courtesy of the Diözesanmuseum in Bamberg, Germany. Previously Kuball has exhibited installations internationally in several group exhibitions including those at the NTT Intercommunication Center in Tokyo (2008), The Black Square: Homage to Malevich at the Hamburger Kunsthalle (2007), the Jewish Museum, New York (2002), the São Paulo Biennial (1998), and the Bauhaus Dessau (1992). Temporary installations of his work have been installed at the entrances of the Museum K20K21 in Düsseldorf and the National Gallery in Berlin. Kuball’s recent solo exhibitions have included CityPortrait at the Contemporary Art Museum in Toyota, Japan (2008), Mies-Mies (2007) at the Centre for International Light Art in Unna, Germany, and Space-Speed-Speech (2005) at the Gallery of Modern Art in Glasgow, Scotland. Mischa Kuball has also exhibited large-scale light and sound installations including those on bridges in Berlin and Geneva, the interior/exterior of a 23-story office building in Düsseldorf (Megasign, 1990) and also at Projekt Synagoge Sommeln near Cologne, where he saturated the building with light from the inside-out. Kuball is Professor of Media Arts at the Academy of Media Arts in Cologne (Kunsthochschule fur Medien Köln) since 2007. Prior to this, he was Professor of Media Arts at HfG/ZKM Center for Art and Media, in Karlsruhe, Germany. Mischa Kuball. Illustrations for Public Preposition no. 1 (2009). Site-specific light projection installation. To be exhibited at the Caserma Cornoldi site in Venice, Italy during the exhibition of détournement 2009, a collateral event of the 53rd Venice Biennial.